05-Aug-2010 -- The car navigational unit brought us to a point about 700 m from the confluence point. We went through a gate and started climbing up the hill. 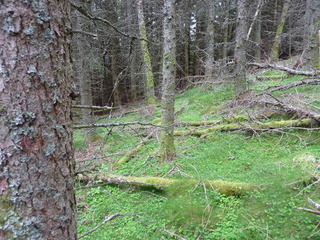 It had rained heavily a day or two before and the ground was boggy and wet making the climb a heavy and warm activity. My back ache which had bothered me during the visit to N60E7 the day before was still with me. The terrain was a mixture of open grass land and very dense spruce forest and we also had to climb or find alternative ways to pass about six to eight cattle fences. Consequently it took us more than an hour to get to the c.p. and almost the same down again. Near the c.p. we found blue markings on some trees indicating a trekking path. We followed it down towards the car for a while, but then it disappeared.